The Way led out of town along the Canal latéral next to the Tarn river. Soon it joined the Garonne. The path headed uphill through small villages. Many pilgrims followed the road by the canal but I wanted to get a better view of where the two rivers met. It was a good choice even though I came across some of the steepest parts of the Way so far. The views of the countryside were beautiful as I descended again to the village of Malause. Peter from the Netherlands was there at a small bar. He had shot past me earlier and I was surprised that he was not at least a day ahead due to the speed he was walking. He sat at a table tending to sore feet while smoking a cigar. A contented smile was on his face and he was happy. The church then chimed midday in a very musical way. The next few kilometres followed the tree lined Golfech Canal. It was very flat, very straight and a bit monotonous. The canal was built as a a side arm to the ‘Canal du Midi‘ to supply vast amounts of water to cool the nuclear power station only a few kilometres away. Traversing the canal and flat land the Way crossed the Garonne River at Espalais before climbing up to Auvillar. A stop for fifteen minutes was necessary to air the feet and socks. 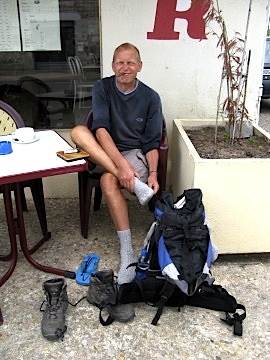 The previous day’s walk to Moissac had taken a toll and my feet were red with some small but interesting new blisters. Auvillar was a fascinating place with a lot of history. 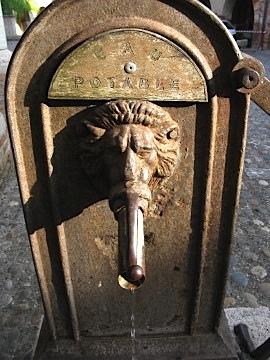 There was a large round central medieval Market Hall and fountain with drinking water (Eau Potable). 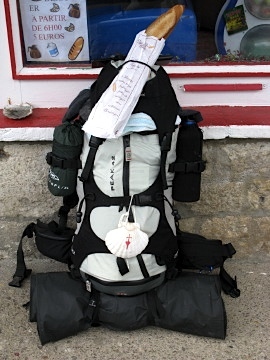 I visited the tourist office where I paid for a bed at the Gite d’étape Communal. The gite was housed in a well restored former presbytery. It had a small garden and was very comfortable. It was the best gite so far. I relaxed after dinner to write the days notes in the garden.